Global Economic Crisis: Can Marxism Help? 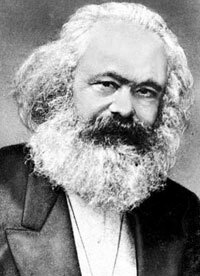 Karl Marx identified the basic cause of repeated economic crises affecting capitalist societies as “under consumption” – consumers purchase less than needed to buy up the supply of goods in the economy, which leads to reduced production, unemployment and financial problems. He argued that it is the inevitable result of capitalists’ exploitation of workers, who are paid less than is owed to them. He foresaw an end to these crises coming when workers rise up, throw off their shackles and take over capital and the income it produces. Marx’s influence has been strong because it justifies the raising of wages with government help, which is welcomed by workers and politicians competing for their votes. For union leaders, the higher wages are a return to their political lobbying efforts. In the past, even employers welcomed the raising of wages during recessions, partly because they believed Marx’s analysis that it would restore prosperity and partly because it would prevent communist revolutions. Roosevelt’s policies aggravated the situation by the use of indirect increases in wages - strengthening unions, the creation of social benefits financed through payroll taxes on employers and the payment of above-market rates to workers on the public infrastructure projects.How great was the damage done by these higher wages created by government policies? Vedder and Gallaway estimated Hoover’s Roosevelt’s raised the unemployment rate from 6.7 percent to 17.2 percent. It is important to remember this history because powerful unions in Canada recommend wage increases to solve the economic crisis of 2008, using the same rationale provided by Marx. On October 6, 2008, Ken Georgetti, the President of the Canadian Labour Congress issued a statement on the economic crisis, which said: “Unemployment will soar if governments, at the national and international level, do not take real measures to fix the real problem of stagnant wages…”(http://canadianlabour.ca/working-families-demand-a-fundamental-change). There is little doubt that fixing stagnant wages means raising them. Jim Sinclair, the President of the BC Federation of Labour in a CBC radio interview on November 24, 2008 expressed this view more explicitly when he said that higher wages are needed so that workers can spend more money and pull the economy out of recession. The raising of wages as a solution to the current crisis is also suggested by US President-elect Barack Obama. He promised to strengthen union power, which would be used to obtain higher wages. He also promised new social programs that would be financed by payroll taxes and thus raise the cost of labour. Why did government induced wage increases raise unemployment during the 1930s and would deepen the current crisis? Simple economic reasoning provides the answer. Employers hire additional workers only if their contribution to the value of the output of firms (marginal productivity) is greater than the cost of the workers (marginal cost), as measured by wages, fringe benefits and payroll taxes. If the marginal productivity of workers is less than their marginal cost, they are laid off and unemployment increases. During cyclical economic downturns, the marginal productivity of workers falls because firms sell less and lower product prices reduce the value of the firms’ output. If under these conditions wages are maintained or raised, unemployment increases and the recession deepens. Importantly, if wages were lowered to equal workers’ productivity, unemployment would not increase. But how would economic prosperity return? Low returns to investment and reluctance of consumers to borrow cause demand for credit to fall and results in lower interest rates, which in turn induces increased borrowing and spending by investors and consumers. One reason why recovery based on this process failed to materialize during the 1930s was the failure of the Federal Reserve to maintain the supply of money and to allow interest rates to fall, according to the findings of Milton Friedman and Anna Schwartz in their famous book A Monetary History of the United States, The current policies of the major central banks of the world acting on this historic experience are doing their best to prevent a repetition of these damaging policies. Unfortunately, the challenges of the central banks are aggravated by the fact that for a variety of reasons, wages have not been falling to match decreased labour productivity. Therefore, unemployment has been rising and demand by consumers has been falling correspondingly, which in turn lowers labour productivity and investment further, in the classical vicious cycle that scares the public and leads many to be very pessimistic about the future. History shows that such pessimism in misplaced. Economies always recover, helped by fiscal stimulus but mainly because lower interest rates eventually lead to more private consumption and investment. However, the speed of recovery is reduced if Marx’s ideas are victorious and lead to government policies that prevent wages from falling or increase them. For this reason, policy makers should ignore the demands for higher wages by unions and for policies that lead to indirect increases in the cost of labour. They should also avoid bail-outs of industries in distress because it lowers workers’ incentives to work for lower wages.